Zimmerman, who allegedly hunted down Trayvon Martin, while armed with a gun, was stupid enough to let himself attacked by an unarmed Teenager. As the prosecution alleged, Zimmerman was on top of Trayvon and shot him. Somehow Zimmerman got injured on the back of his head, in spite of sitting on top of Martin. It just makes more sense to believe the easier explanation. Zimmerman stayed put, Trayvon Martin backed up and attacked Zimmerman. (3) The media and the prosecution never came up with a coherent story of what they think has happened. The prosecutors, in an interview, stated that they were interested in discrediting Zimmerman’s story, not in producing a story of what had really happened. Such a narrative would be so ridiculously unlikely that every detractor to Zimmerman’s innocence carefully avoids it. The only sensible story is Zimmerman’s testimony that was given before police, right after the facts, without a lawyer, without careful preparation. It was checked by capable police and until today, no lie has been uncovered. Defense attorneys allege that data wasn’t turned over to them as part of the evidence exchange process, known as discovery." George Zimmerman is such an honest guy, he said ‘That Doesn’t Even Sound Like Me’ Screaming For Help. Trayvon Martin’s father had said to police that the screams were NOT his son’s, but then later lied and denied this, against the testimony of TWO police witnesses. Martin’s mother, of course, was totally sure it was her son (after all, if Zimmerman cried for help, it was clear self defense, there would be no question but to acquit due to proven innocence. Of course, as in (2), there is no coherent story: how Zimmerman could be on top of Martin, get his nose broken, the BACK of his head seriously injured, and it is extremely unlikely how Trayvon’s hoodie was several inches away from his chest when the bullet hit (proven by forensic analysis). Additionally, we have never heard of grass and wetness on Trayvon’s back. Rachel Jeantel, Trayvon Martin’s girl friend, was carefully prepared for weeks, and deposed by the Martin family lawyer before ever testifying before officials. Still she perjured herself several times. All testimony by lying perjuring witnesses ought to be totally discredited. Compare George Zimmerman‘s testimony with no preparation, no lawyer, no inconsistencies. But the statements of Trayvon’s mother and his girl friend are always touted as the ultimate truth. Such is " civil rights" and political correctness. Focusing on discredited evidence, discarding clear uncontestable depositions. Right, Mrs. Clinton. Zimmerman’s mother should not be in fear of him walking down a street in his neighborhood, needing a gun to defend himself against an aggressive black young man attacking with deadly force. A young man who had walked in between houses, looked into windows, probably considering breaking into them to get more jewelry, as has been found in his school pack. This is Black culture? Just found these scary videos, with hundreds of thousands of views each. Any doubt that a white boy, venturing into a group of these people would be an instant victim of racial profiling ?? Nipsey Hussle – Fly Cripping. TMC. Official Video. Add such bad cultural influence to the widely proven genetic differences in IQ and criminality (see links below) and you get terrible results. Rap music is an example how to have financial success without need for high IQ. Whites with similar lyrics languish in European prisons for violating hate speech laws, like the authors of "Affen nach Africa" (Apes back to Africa). I now understand Reverend Manning‘s concerns about the Black Race and the immorality of rap. "She wanted to find him guilty of something, but couldn’t because of the way the law is written. He wasn’t responsible for negligible things that he had done leading up to that point," she said, stressing that she and the other jurors took their responsibility seriously. "I don’t want people to think that we didn’t think about this, and we didn’t care about Trayvon Martin, because we did. We’re very sad that it happened to him," she said. Trayvon Martin was kicked out of his mother’s home for misbehavior. Trayvon Martin had multiple school suspensions for possible felonies. Had the Martins family educated their son better, had they cared about his school suspensions. Had they provided him a family with a father who keeps his sons in school, prevents them from violating laws. Had they stopped him from fighting in school, and made sure he does not harbor a criminal mind with anger that likes to physically injure people. Then this would not have happened. "I feel bad that we can’t give them the verdict that they wanted, but legally, we could not do that," she said. Rachel Jeantel called the verdict "BS" and said Martin, 17, was never aggressive. "He was a calm, chill, loving person who loved his family, definitely his mother, and a good friend," Jeantel told CNN’s "Piers Morgan Live." They keep lying. And the press gobbles it up, instead of calling her bluff and lies. We will try to make up a complete story. Double Jeopardy for George Zimmerman? 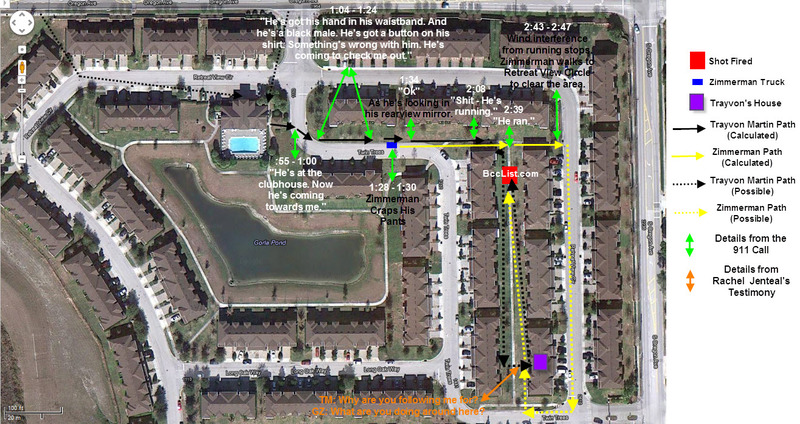 I am not a fan of the theory that Trayvon walked home then returned to confront Zimmerman. 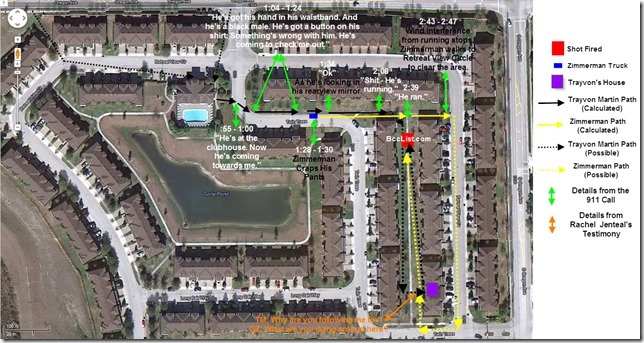 The evidence points to Trayvon hiding in the bushes near the T intersection, ditching his burglary tool there then ambushing Zimmerman. George Zimmermann, here is your lawsuit against MSN. They all George an Assassin, in their Brazilian portuguese edition. Next Next post: MSN calls Zimmermann Assassin. Defamation lawsuit.to follow?